In a major new study released this week, scientists have just discovered that as the sun sets on the planet Mars, it is sometimes subjected to harsh snowstorms which batter the Red Planet. NASA’s Phoenix Lander measured snow particles falling on Mars, back in 2008. At the time, it was suggested that the snow fell slowly and gently. 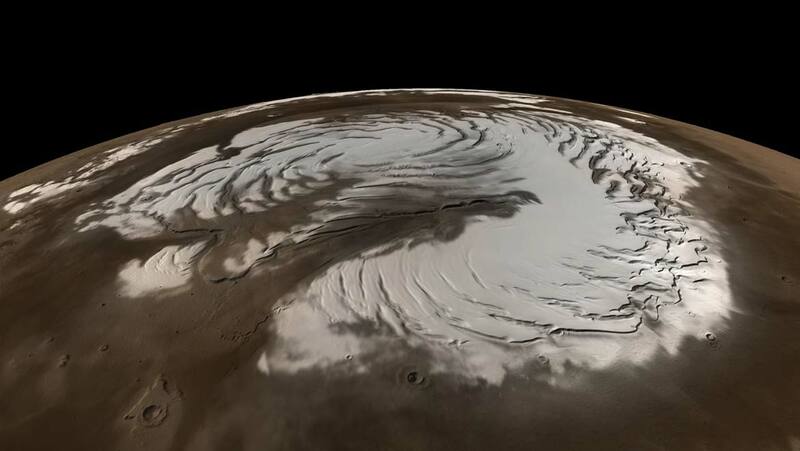 The models of the atmosphere of Mars released in this new study instead suggest that the snow forms intense and bitter storms. Because the snowstorms will have a significant impact on the distribution of water vapor, dust and other chemicals within the atmosphere of Mars, this discovery might well mean that existing atmospheric models for Mars need significant updating in order to better reflect these newly discovered weather conditions. The study used data from two spacecraft orbiting Mars: the Mars Reconnaissance Orbiter and the Mars Global Surveyor. Data from clouds forming around the equator of the Red Planet was collected and examined, leading to the discovery that the weather conditions were quite different to what had been expected. "It's the first time anyone has shown that snowstorms, or water-ice microbursts, occur presently on Mars. We used much more sophisticated and fine-scale modelling than done before, allowing us to reinterpret existing measurements that posed mysteries." Radio occulation measurements showed the team of scientists that upon night falling, Mars is subjected to something referred to as turbulent mixing, or night-time convection, in the lower section of the atmosphere. This convection, thought to stem from water-ice clouds as they cool, leads to fast currents of downwards air, combined with intense localized snowstorms. The paper, titled ‘Snow precipitation on Mars driven by cloud-induced night-time convection’ has been published in the journal Nature Geoscience. It was co-authored by David Hinson, Aymeric Spiga, Jean-Baptiste Medeleine, Thomas Navarro, Ehouarn Millour, Francois Forget and Franck Montmessin. The researchers have also now created new atmospheric models to see if it might be possible to predict how these snowstorms will behave. Given that there is interest in colonising the Red Planet, this new research is incredibly important to further our understanding of one of our closest planetary neighbors.